raw materials for a wide variety of both commercial and industrial products. crop protection, consumer products, detergents, crystal glass and ceramics. It is produced by reacting a naturally occurring mineral, fluorspar, with sulphuric acid. HF is a strong corrosive acid which must be handled with extreme caution. 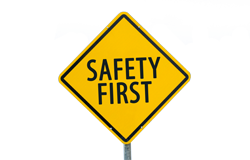 Safety is therefore the primary concern of both producers and users. The major activity of Eurofluor (CTEF) has been the issuance of recommendations on the safe handling of hydrofluoric acid during production, storage, transportation and use. In 2015, European hydrofluoric acid production reached 232,000 tonnes with a value estimated around 270 million EUR. Around three hundred people are directly employed at nine HF production sites in four European countries. It is estimated that the total number of jobs related to the fluorine industry, including downstream products, amounts to more than 50,000.